September 11, 2018 at 7:34 pm. 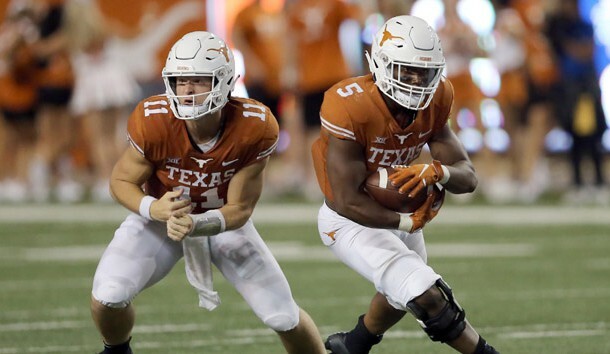 Texas coach Tom Herman said his team is still a work in progress after the first two games of the 2018 season and he expects the Longhorns to take another step forward when they host No. 22 USC on Saturday at Darrell K Royal-Texas Memorial Stadium in one of the college football campaign’s most anticipated showdowns. Herman’s sentiments mirror those of USC coach Clay Helton — the best is yet to come for his team. Texas comes into the game with the Trojans on the heels of a tougher-than-expected 28-21 home win over Tulsa. Quarterback Sam Ehlinger finished 21 of 27 for 237 yards with two touchdowns and fumbled once against Tulsa but played well overall, especially at the end of the game when he engineered a 13-play scoring drive with the help of some check-down passes, including one on Texas’ final TD. “Sam played really, really well, really well, managed the game well, checked us into some really good plays versus blitz,” Texas coach Tom Herman said. “He handled the tempo well, he handled the uniqueness of Tulsa’s defense well. Texas’ game notes release states that Saturday’s game is the seventh all-time meeting and that USC holds a 5-1 series record.